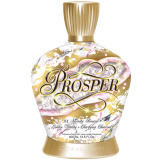 Designer Skin Prosper Golden Vitality and Clarifying Charcoal. Serenity 9x Bronzing Blend with DHA and Caramel. Golden Vitality contains a blend of melanin. Clarifying Charcoal helps to detoxify and rid away skin impurities.